Google Maps has opened up access to resources that would take considerable work and expense to access. Just purchasing software that can do ray tracing over a geographic area 10 years ago would have cost tens of thousands of dollars. Now “HeyWhatsThat” has leveraged Google Maps to do just this and it is free. Now, why would I be so interested in this site? Being a bit of a wireless geek, it is a great starter tool to understand how much coverage area a mountain top has. 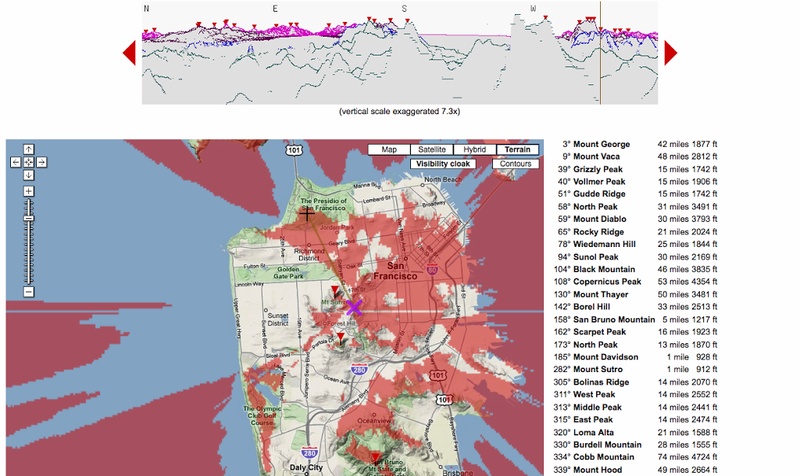 In the example shown in the right you can see the coverage area from the Twin Peaks communications site in San Francisco. The orange/red overlay indicates area that this site can see. You can see the shadowing of some of the hills of San Francisco affecting the coverage area. At the top of the frame, shows a panorama of the skyline seen from that site. The list on the right shows what mountain tops can been seen and distance to them. HeyWhatsThat is a great starting point in checking out coverage area. I wouldn’t throw away your $50,000 coverage software just yet as that will be a bit more accurate using better algorithms to calculate coverage such as Longley Rice and TIREM as well as their own tweaks. EDX still rules in my opinion but wow I have to check this out. Any idea where the elevation data comes from? USGS, SRTM? Thanks Tim! A tremendous way to spend more time in front of the screen.